To secure your swimming pool is not an option to be considered, but a law to be strictly respected. Since 2004, the law obliges any owner of a swimming pool to install a standardised safety device. For an utmost safety, choose a device which covers and closes your swimming pool. This way it completely prevents the access to water. Only the safety covers, the bars covers and the rolling shutters will be able to guarantee that your children will not fall into water. 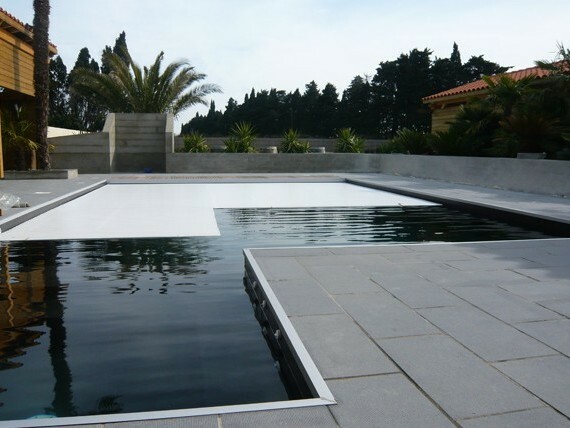 These pool closing systems also offer the advantage of storing the heat; they protect the water from dirty elements and pollution during wintering. Pool covers (not to be confused with simple flexible covers) and rolling shutters are the most reliable safety equipment. Your children can walk on them. The rigid and solid structure of the covers and the shutters is made to resist the standard weight of an adult. If you wish to install rolling shutters in your traditional swimming pool, MARINAL advisers will present you the ‘above ground’ rolling shutters systems and immersed shutters. The above ground shutter is installed with a roller placed on the border. It can be manual, electric or solar powered. For a harmonious integration in your pool environment, MARINAL will propose you to equip the roller with a box which you can turn into a bench for example, or arrange flowers in it. The immersed shutter is an installation to be considered as of the plans of construction of the swimming pool, because it is hidden in a box built right in the pool structure. The opening of the shutter is operated by remote control and the roller is equipped with sensors to stop automatically when the shutter reaches the other end of the pool. 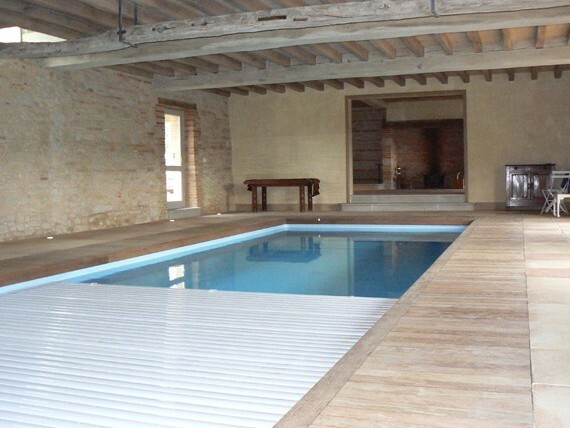 It is possible to install an immersed pool shutter during the restoration of a swimming pool, but in this case, the immersed box will be built to the detriment of a little bit of the pool volume. Pool shelters have the advantage of creating a closed perimeter around the swimming pool, a true ‘security bubble’, but inside the shelter, the access to water must remain under the vigilance of adults. There are many kinds of pool shelters designs so that you can find the one that will best integrate your environment (telescopic, adjustable, or removable). For the installation of a pool shelter, MARINAL works with reliable partners who will be able to fulfil your every wish. 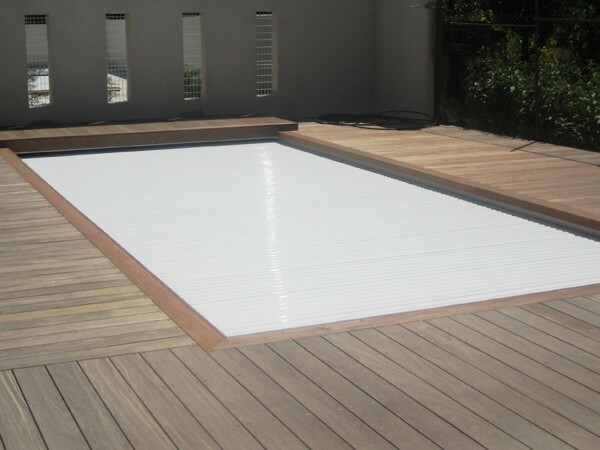 Pool safety barriers are used to secure the direct access to the pool. The safety standard requires that these barriers measure at least 1,10m in height. At the time of purchase of a pool safety barrier, the gate opening system is also validated by the Laboratoire National d’Essais (French national test lab). The validation is based upon tests relating to childcare constraints. 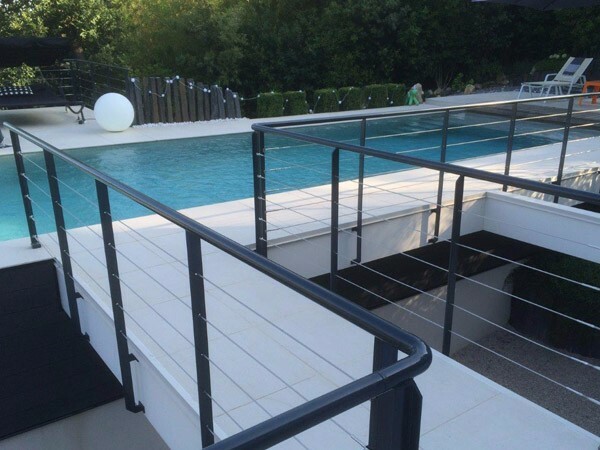 As for prices, pool barriers are an economical safety device. As for design, however, they are not the most attractive solution. They quickly stop the glance and hardly fade into the background. If you are looking for a more discrete solution, choose instead rolling shutters, pool covers or even alarms. There is an impressive quantity of different pool alarm systems: alarms detecting falls, immersion detectors, immersed alarms, infrared perimeter alarms… All alarms are very beautiful and very economical solutions. As for their efficacy, you must react very quickly when the alarm is triggered; it is thus vital to always remain near the swimming pool when children are around. Alarms are also a constraining system as it is necessary to think about restarting them after each bath and regularly verifying that they are functioning well. Your MARINAL specialist is at your disposal for any question relating to the safety systems for your traditional swimming pool project. Do not hesitate to use our online contact form.